You know when you meet someone and you instantly click? That’s how it was when I met Chamintha, one of the owners of Ayu in the Wild, a tour operator offering experiential travel in Sri Lanka. Although I had a jam-packed schedule during my time in Sri Lanka, I knew I just HAD to fit in a customized tour with Ayu in the Wild and I’m so glad that I did. Chamintha and her husband Rajindra, who are both Sri Lankan and live in Colombo, have traveled extensively around Sri Lanka for years, long before they went into the travel business. Ayu in the Wild was born out of a passion for experiential travel. Travel that actually integrates visitors into the culture, so that you are not just an observer checking off the popular Sri Lanka tourist attractions. Ayu in the Wild knows the secret spots that leopard love – outside of Yala, like this rock where they sun themselves. Each tour is customized and personally curated by Chamintha and Rajindra according to your interests. They have visited every single place they take their guests to, often repeatedly. As a result they have built great longterm relationships which translates into exceptional service. Also of note, is that they try to work with locals and local companies, wherever possible, benefitting the local economy. A few of the Sri Lankan locals that Ayu in the Wild works with. So how do they create such a unique experience for you? They first find out your interests and what you are interested in seeing and doing. They offer tailor-made itineraries for families with children from as young as three, all the way up. One of the activities includes the opportunity for children to meet local children from rural communities, which I think kids would love! 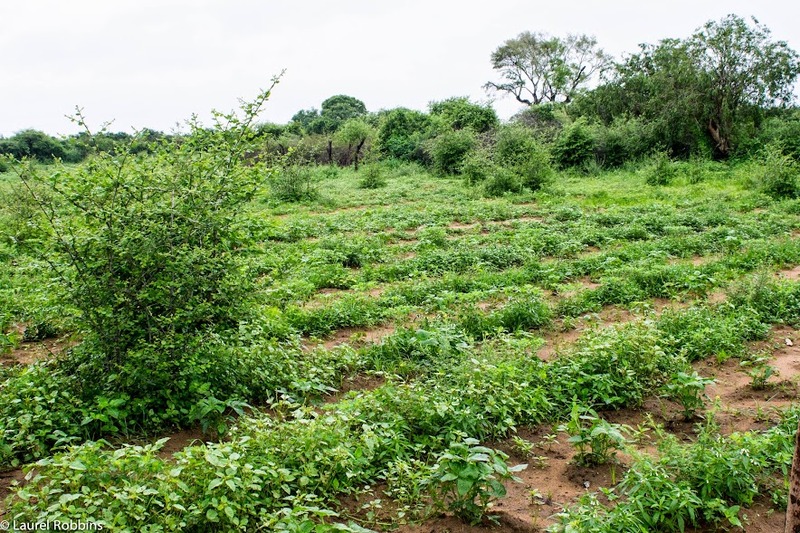 They offer everything from wildlife safaris, to food safaris to village walks and village interactions to learning how to cook over an open wood fire stove to scenic tours. You tell them your accommodation preferences whether it be staying in a rustic tree house, glamping, as I did or staying in a luxury boutique and they take care of the rest. 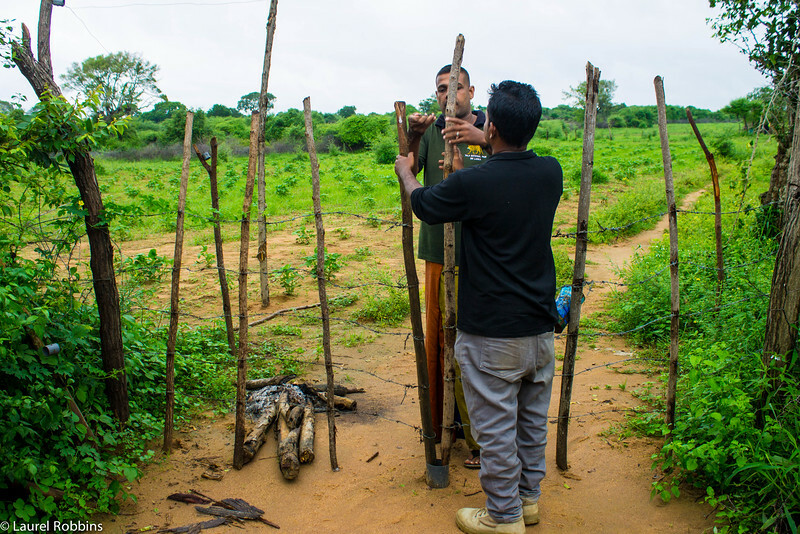 A visit with a farmer to learn the secrets to protecting their crops from elephants. They also take care of the transportation, which is really crucial in Sri Lanka. It’s not an easy country to get around by yourself and public transportation isn’t the most convenient. With everything personally curated for you, all you have to do is soak in the Sri Lankan experience! On my personally curated trip, I was the only guest. Each trip is curated for each guest so you won’t be travelling with other guests. I was picked up in Beruwala where I was staying and taken to Wild Trails Yala, an incredible tented safari camp. There are only four tents and the path to each tent is lit up by lanterns and we dined under the stars! Truly an incredible experience. 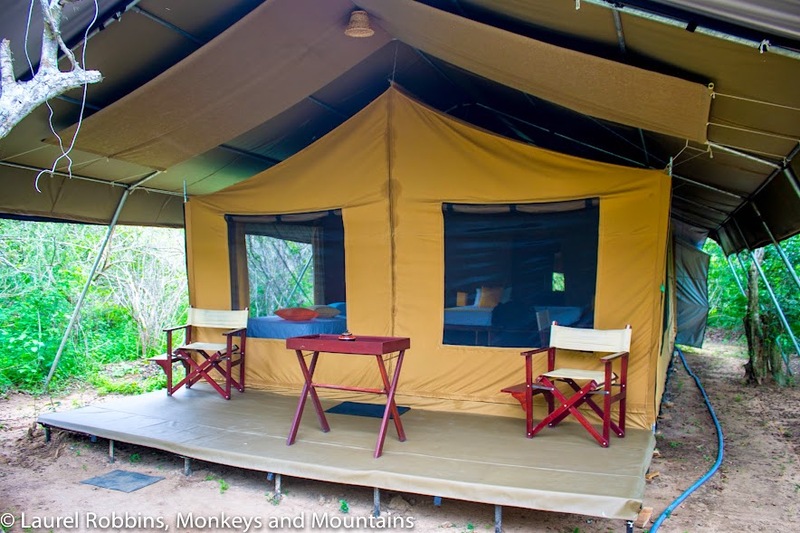 My tent at Wild Trails Yala, glamping at its finest! My itinerary included a visit Yala National Park. Although Yala is one of the best places on the planet to see leopards, Ayu in the Wild really encourages guests to appreciate everything the park has to offer, and not just focus on the leopards. More coming soon in an upcoming post. I also visited a local family who had been caught in the Tsumani in 2004. Their home had been completely destroyed, but fortunately they were OK. The family supported itself largely through making and selling buffalo curd, but was struggling. 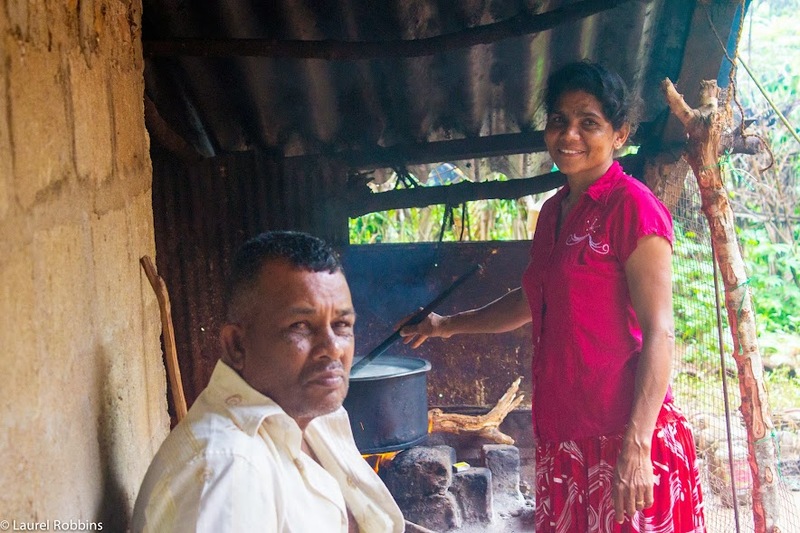 Although education is free in Sri Lanka, in the rural areas there are often not enough teachers and the family is struggling to pay for private classes for their three girls. Visiting a local rural family in their home is such a unique experience, and has a direct economic impact. It’s this type of experience that can only be arranged by trusted locals like Chamintha and Rajindra. Visiting the home of a local family of Tsunami survivors who makes their living by selling buffalo curd. 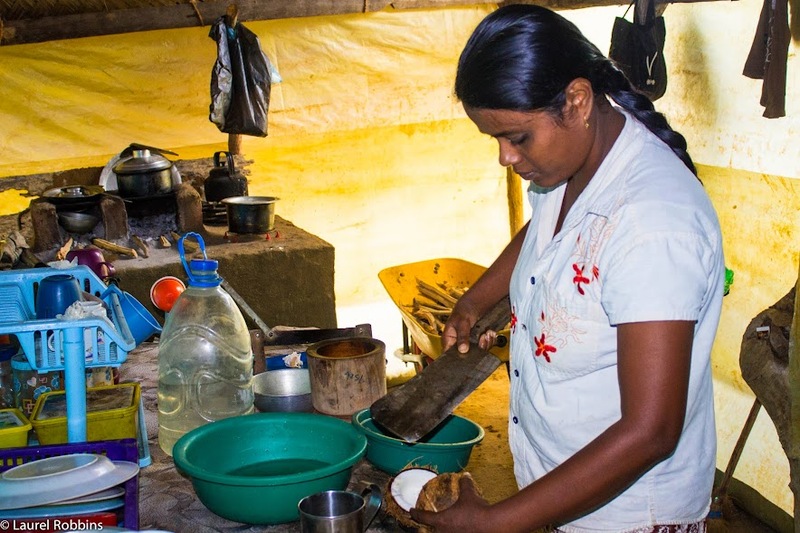 Knowing how much I LOVED the local Sri Lankan dish Coconut Sambol, Chamintha decided I couldn’t leave Sri Lanka without learning how to make it, so that I could make it when I returned home. The cooking class didn’t take place in a big fancy kitchen with a pre-arranged menu, but in a make shift kitchen in the middle of a farmer’s field, where I learned how the farmers protect their crops from elephants. It was the most authentic cooking class I’ve ever had as the farmer’s wife put me to work! And even better, it was supporting locals at the grass-roots level, AND it tasted delicious!!! Learning how to make Coconut Sambol from a Sri Lankan farmer’s wife! It’s these type of personally curated experiences that create memories and make travel meaningful long after you’ve left! Even though I only had two days with Ayu in the Wild (you really should book a minimum of six days with them), I felt I had gained insights into the Sri Lankan culture that I had not gotten in the previous two weeks of my stay. Traveling with Ayu in the Wild provides you with such a unique experience and is an exceptional way to see Sri Lanka. I can’t recommend them enough! Contact Ayu in the Wild as far in advance as possible to reserve your space. They are a small husband and wife owned company and they fill up quickly. Let them know what type of experiences you are interested in, but then trust them to the details. They know Sri Lanka incredibly well. If you tell them you want to go birding for example, they may very well take you to a spot you hadn’t heard of, but trust them. They really know their stuff and the place they take you to will be so much better than the popular spot that everyone else visits. Plan to spend at least six days with them – longer is better. Although Sri Lanka is not a big country, there is a ton to see! Let them take care of all of the itinerary, including the activities, accommodation and travel. Note: Thank you to Ayu in the Wild for making my visit possible. As always, all opinions expressed are my own. This looks like a great way to learn about the local way of life. I'd love to try it some day. What a great way to learn about a country, people, and culture. Thanks for sharing your experience. Thanks for sharing this post! 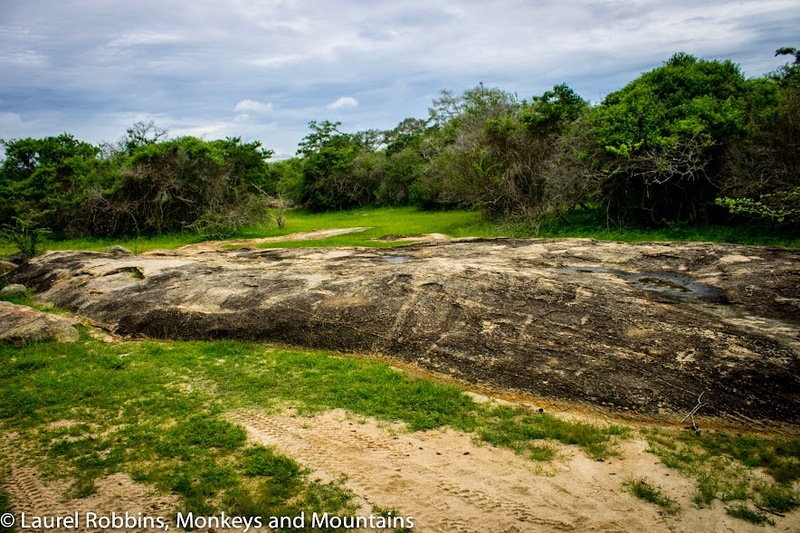 Yala National Park sounds absolutely incredible. I can't believe that family displaced by the tsunami makes a living by selling buffalo curds. @Brandon - It's a pretty tough living, not enough to pay for their children's additional classes that they need unfortunately.